The Rusty Blackbird (Euphagus carolinus) is a medium-sized blackbird, closely related to grackles. This bird prefers wet forested areas, breeding in the boreal forest and boglands across Canada and New England, and migrating southeast to the United States during winter. Formerly abundant, the Rusty Blackbird has undergone one of the most rapid declines of any bird species in North America, for reasons that are not well understood. In 2014, DC Audubon partnered with the International Rusty Blackbird Working Group, eBird, the Cornell Lab of Ornithology, and the Vermont Center for Ecostudies for the first Rusty Blackbird Spring Migration Blitz to encourage DC area birders and others to be watchful of and report sightings of Rusty Blackbirds during their spring migration from Southern wetland forests to their Canadian breeding grounds. Data from long-term birding surveys suggest that Rusty Blackbird numbers have plummeted a staggering 85-95% since the mid-1900s. Earlier recognition of population declines was likely inhibited in part by the elusive nature of this species, their close association with wooded wetlands and other habitats that are often difficult to access, and cultural biases that cause “blackbirds” to be overlooked as common and resilient species. Several hypotheses have been suggested to explain the decline in “Rusties”. Although studies of nesting Rusty Blackbirds show relatively high rates of survival on the breeding grounds, loss and fragmentation of wooded wetlands in southeastern wintering grounds is a likely contributor, coupled with increased competition for food in these locales from other blackbird species—such as Red-winged Blackbirds and Common Grackles. 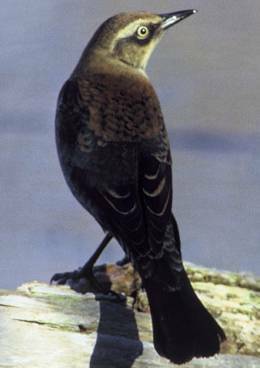 According to the International Rusty Blackbird Working Group, of all aspects of the Rusty Blackbird life cycle, migration is the least known and documented. Scientists have determined that Rusties use an eastern Atlantic flyway, a Mississippi flyway, and possibly a Central flyway. The Appalachian Mountains appear to be an important feature dividing Rusty Blackbird populations during migration and over the winter, as few birds cross the mountain range. Despite these important insights, we still have a long way to go towards understanding the migration of Rusties. Do they have specific routes, and do these pathways change from year to year? What stopover habitats do they use, and is their use of these stopover locations consistent from year to year? Answers to these questions are important to advancing conservation of this vulnerable population of birds. During the official Blitz dates (March 1 – June 15, 2014), a total of 13,398 checklists that contained at least one Rusty Blackbird observation were reported to eBird. This represents a 61% increase in checklists with observations of Rusties compared with the previous year, in a year when overall eBird reporting increased 30%. The District of Columbia contains a tiny segment of Rusty migration and wintering habitat. However, there were 28 Rusty Blackbird reports submitted from DC birders to eBird during this time of the Spring Blitz 2014, compared with 22 checklists across the same period in 2013, representing a 27% increase in reporting during the Blitz. Kenilworth Aquatic Gardens is by far DC’s richest habitat for sightings of Rusties. Although the high count during the Blitz period at this site was only 7 Rusties on 4/5/2014, there was an all time high count of 250 Rusties at this locale on 4/3/2008. In fact in 2014 the highest count of Rusties at this locale was 29 on 1/27/2014. Other reported sightings in DC for 2014 were at National Zoo, Rock Creek Park (at Beach Drive/Park Road); Teddy Roosevelt Island, Constitution Gardens, C&O Canal at Chain Bridge, and Gravelly Point, with at least 1 Rusty sighting at each locale. Because so little is known about Rusty Blackbird migration patterns, it’s impossible to draw conclusions from the data above. This is why regular reporting of sightings is so important for researchers, to help determine the most effective strategies for conservation. The International Rusty Blackbird Working Group’s Spring Blitz began on March 1, 2015. DC birders are once again encouraged to look for and report sightings of Rusties to eBird, using the Rusty Blackbird Spring Migration Blitz protocol. To do so, check the box for “Other” survey type on the eBird observations form under “Date and Effort” and select “Rusty Blackbird Spring Migration Blitz” from the drop-down menu. Further guidance will pop up to help you describe your sightings of Rusties. For more information on Blitz objectives, along with Rusty Blackbird identification tips, data collection instructions, and data reporting information, visit http://rustyblackbird.org/outreach/migration-blitz/.